When I am hired to photograph a wedding on an unknown private ranch in one of the southern valleys of Montana, creative portraits can be a wild card. None more so than at Corral Creek Ranch in the Madison Valley with Whitney and Dan this summer. I didn't know when we'd fit in our creative portraits or if they'd even work. One of the things I hope for is bright sun or dreary or dramatic weather as that helps me create images that fit within my style of 'edgy' wedding photography. I dread the bland or plain imagery that populates much of the wedding world. Here I was given a gift: an incoming thunderhead at sunset. It's a perfect backdrop for off camera flash and, with the help of the groom's brother, we nailed it. 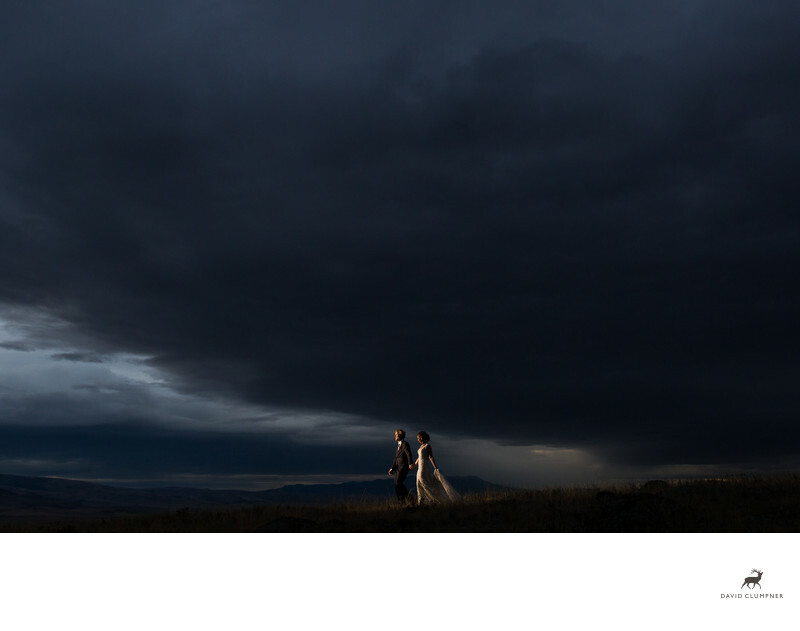 I am especially proud of this composition as I waited for the couple to not only be centered but to also drop their heads just beneath the dark line of the cloud above. And I probably got a touch lucky with body positioning being that it's totally perfect. Dan's hand is extended and glowing, both sets of legs are in motion and Whitney's body shows both form and shape with a touch of her dress being carried from behind. It's an awesome image, really, and I'm very proud of it. Location: Corral Creek Ranch 1485 Bear Creek Loop, Cameron, MT 59720.